In case you've been wondering why I haven't posted lately here's what's going on. Without going into detail, this year has had a few too many setbacks, sadnesses and life stresses. Not all bad of course but just a lot crammed into a short period of time. Now I am big on living life with purpose but I found that trying to keep it all together was not working. So I went the other route and let a lot of it go. As I turn 50 this month I have chosen to go on a quest to connect with 50+ women who have had an impact on my life thus far and walk a mile in each of their shoes. Part 1 has already started here in Michigan. Part 2 continues on a 2,000+ mile road trip through the midwest, down south, up the eastern coast and ending (except for a future trip to Hawaii) in New York - my birth state. If you have any interest you are welcome to follow along with my photo album of this latest little cooky experiment. But I warn you, this is both a figurative and a literal challenge. 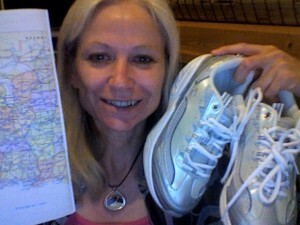 Here is the link: Annie's Awesome 50/50 Adventure. Understand that while I hope you can have fun with me, I am mostly hoping that this journey will inspire you to create your own awesome moments of connection with the people that have been important to you. I would love to hear how you are celebrating your life on this planet! Posted in 50/50 Adventure, Adventures, Grab Bag on October 10, 2011 by annie zirkel.